Providing a safe, friendly and enjoyable working environment for all of our team, customers and visitors. Backup Security Directors, Steve Randi and Vicky Baldwin, recognise that people are their greatest asset. Backup Security recruitment, training and management practices are all directed at ensuring security services are provided with 100% professionalism. Our uniformed Security Officers deliver a diverse and challenging range of work. They adhere to the Security Providers (Security Firm Code of Practice) Regulation 2008, as well as our clients? policies and guidelines. 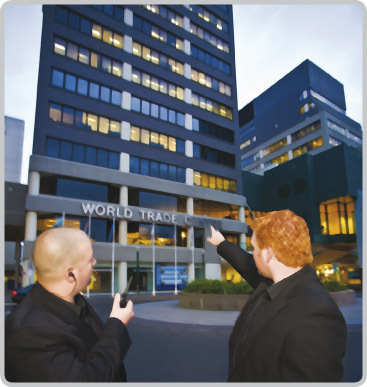 We provide continual training for Security Officers Australia-wide, including conflict management, law, first aid, investigation and other relevant qualifications to maintain their confidence and professionalism in an ever-changing security environment. Clients, police and the general public regularly commend our officers for their professionalism and dedication. Steve is a Level 3 Security Officer with extensive experience in law enforcement. He has studied for his Diploma in Justice and has extensive training and qualifications in the field of security services. You wont find Steve behind a desk. You will find him working with and traini n g his team, working with clients to develop better security measures, or liaising with police and industry associates for up to date information. Vicky is passionate about the business of security and is heavily involved in security administration and management. Vicky has also completed an array of training in security and hospitality. Michelle is our Administration Officer and the heartbeat of the company, keeping in touch with customers and staff. Michelle explains our services to customers, takes bookings and manages our business administration. Backup Security searches for and finds the best of the best. We have incorporated a ‘knowledge team’ into our management system. Our knowledge team is made up of our most loyal, dedicated and experienced officers, who attend regular meetings aimed at continual improvement of our security services.